Ferns Diocesan Pilgrimage to Santiago de Compostela – Year 3 – 21st to 28th August 2016 from Burgos to Calzadilla De Los Hermanilos, 145Km. On the 21st of August 2016 a group of people gathered in Dublin Airport. For some people this would be their beginning to their journey along the way of St. James on the Camino. 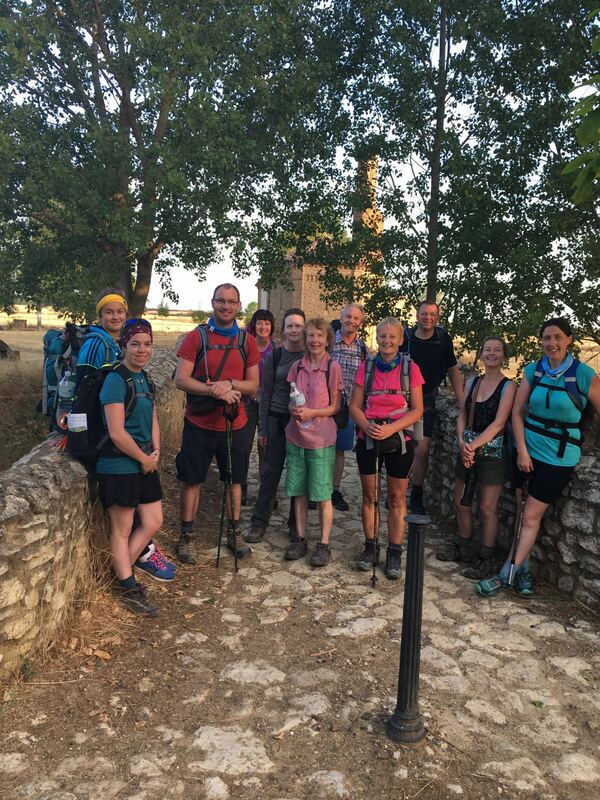 For others, this was a time to reconnect with those fellow pilgrims they had met the year previous on the Camino. Greetings, hugs, memories and laughter paraded around the group and with a spirit of fellowship and comradery we soon found ourselves in the welcoming heat of Burgos, our starting point of this year’s pilgrimage. Bustlings traffic, car horns, phone ringtones, message alerts, emails, the tip-tapping of the laptop keyboard, the whirl of the washing machine, the early morning school bell. These were just a sample of the sounds that made up the melody of our lives at home in Ireland. The business of the world had its own tune and rhythm. However, as on any pilgrimage we leave our centers and move towards the edges of our lives as if in search for something other, something more than the hum drum of this noisy world. In the days that followed we found ourselves a new melody that came from within and that would stay forever. With an early rise on our first morning we were greeted by many things; the cool morning air, the bitter smell of Spain’s famous Cafe Con Leche, and soon enough the rhythm of the footfall and walking sticks of the group. Patrick Kavanagh knew this simplistic melody in our own land and soon enough we became in tune with the “footfall tapping secrecies of stone”. Maybe we would discover these secrets or the unknown truths of this world, maybe we wouldn’t. It was clear, however, that we were all on search for something. It was early on in the pilgrimage when the voice of our spiritual director of the pilgrimage rang through the group, with a cheerful, “I’m A-live, A-lert, A-wake, Enthu-si-astic!”. After a rendition or two of this catchy chant, it soon became the mantra of the group as it became embedded in our minds and in our walking. Such simple words and rhythms seemed to speak a deeper truth to us as we followed our feet along the path of St. James. I am alive. This Camino journey reminded us that we are Alive in every sense of the word. The harsh conditions of the sun and the lack of water fountains reminded us of our vulnerability and frailty. 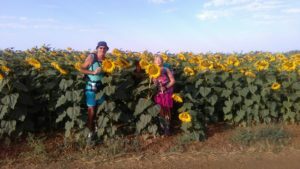 The true physicality of the Camino, with its long 30km walks through the Meseta, a desert like region through the North of Spain, earthed ourselves in what it was to be human in all our frailty and our strengths. I am alert; Alert to what truly matters in the world. 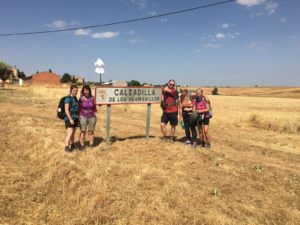 Walking the Camino is about a shared experience. As we walked the path of St. James we became alert to the mass, silent community that walks with us. We met people from as close as Co.Clare and as far as Japan and Brazil along this year’s journey. We all looked different and spoke different languages but when we walked this path we walked as one. We became alert to the silent spiritual community that is the Camino. I am awake. What does it mean to be awake on the Camino. Yes, we awoke and clambered from our rickety bunk beds at the early hours of the morning but on the Way we became awake in other ways. We became more spiritually awake. In this Year of Mercy we became awake to recognising the face of Jesus in the kind acts of mercy on the Camino. Whether it was in the eyes of a Dublin Priest who helped our sick or in the act of sharing our little water with many, the sacramentality of the acts rang through. Our eyes were opened to the face of God in creation around us. Through daily celebration of the Holy Mass and recitation of the Rosary and Divine Mercy Chaplet we became spiritually awake to a sacred otherness that also walked alongside us. St. Faustina, a Polish mystic nun, became awake to Jesus in her visions of the image of the Divine Mercy and through this the world was changed in a very special way. As we return home to our lives in Ireland we too hope that our spiritual awakening can be brought back into our own homes and lives in order to change us in another very special way. I am enthusiastic. 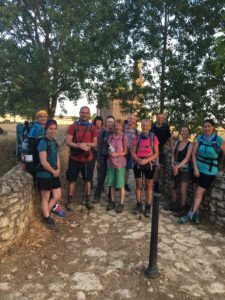 Exhausted, dehydrated, sunburned, blistered and aching would be one way to describe a Camino pilgrim. These may seem like negative attributes however on this journey we found that it is through these attributes and feelings that we are spiritually revived. As the newly canonized Saint Mother Teresa said “Pain and suffering have come into your life, but remember pain, sorrow and suffering are but the kiss of Jesus – a sign that you have come so close to Him that He can kiss you”. Through this year’s pilgrimage we have embraced our hardships and come out refreshed, energised and ready to tackle the more figurative hardships of our lives back home. We leave the Camino in Calzadilla De Los Hermanillios with a new enthusiasm and appreciation for life and wellness. We return home to celebrate life – a celebration of the gift of life and we shall live it with an intense and eager enjoyment.